One of the most important and often overlooked aspects of Biblical studies is the study of the Greco-Roman world in which 2nd Temple Judaism and Early Christianity found themselves. By better understanding the culture and the religions that surrounded the worlds in which Judaism and Christianity matured, one can better understand the historical projections that each religion took. Provided in this LibGuide are links to important online resources including: Databases, websites, journals, and Ebooks. These will provide students with key introductory and intermediate resources to help write papers, keep up-to-date with current academic studies, and the lastest monographs. As with all LibGuides, these are just some of the many resources available to students. Please use the search bar above to gain access to the full catalog of books and articles. This collection of annotated bibliographies features almost 300 articles covering a variety of topics concerning the Greco-Roman world. This should be the first stop for students attempting to find resources. This database offers access to hundreds of Greek and Latin sources. What makes this database unique is that it includes a parsing tool and dictionary to aid in translation. It also provides access to public domain English translations of the texts when available. It is an open access project, meaning that patrons and non-patrons have equal access to every part of the project. The entire collection of Harvard Press' world-class Loeb Classical Library is available through this database. The most important works of classical literature are available in the same bilingual (Greek-English or Latin-English) format that made it famous. Constantly updated, this database is invaluable for understanding the Greco-Roman world. "Classical Inquiries (CI) is an online, rapid-publication project of Harvard’s Center for Hellenic Studies, devoted to sharing some of the latest thinking on the ancient world with researchers and the general public. The primary author for CI will be Gregory Nagy, who is currently the Director at the Center and the Francis Jones Professor of Classical Greek Literature and Professor of Comparative Literature at Harvard University in Cambridge. Nagy will post on a wide variety of topics and will be joined by an intergenerational team of CHS researchers from Harvard and beyond." "As part of its mission of bringing together a variety of research interests centered on Hellenic civilization and sharing them with a wider audience, the Center for Hellenic Studies publishes books, journals, proceedings of colloquia, discussions, databases, lectures, and other materials, both online and in print." An online site dedicated to the study of Greek Mythology. Although this site is not associated with any academic institution it is an excellent source for introductory information on Greek mythology and provides sources for all of its information. "AWOL is a project of Charles E. Jones, Tombros Librarian for Classics and Humanities at the Pattee Library, Penn State University. The primary focus of the project is notice and comment on open access material relating to the ancient world, but [it] will also include other kinds of networked information as it comes available." 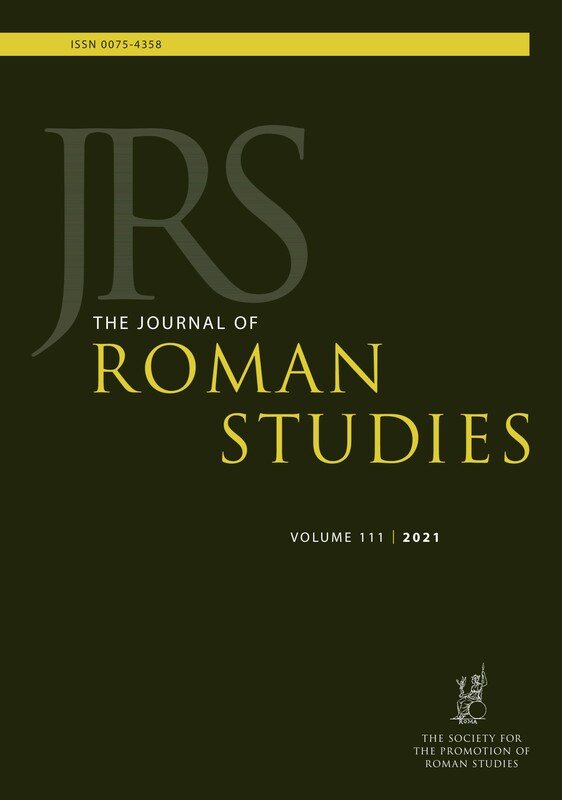 " The Classical Journal publishes scholarly articles on Greek and Latin language and literature and on all other aspects of classical studies, together with book reviews. Its Forum section features articles devoted to pedagogy." "This peer-reviewed journal publishes contributions on all aspects of Greek and Roman literature, history, and society; on the classical tradition; on the history of classical scholarship; and on the teaching of Latin, Greek, and classical civilization." DTL coverage: 1957-2012 (Vol. 51, No. 1 - Vol. 106, No. 1) with a 5 year moving wall. "Kernos is the only international scientific journal entirely devoted to the study of the religious facts and phenomena in ancient Greece. It aims at providing, not only to the scholars of this field, but also to everyone interested in religious problematics, an instrument of reflexion and working tools to progress in the knowledge of the religious system of the Greeks." "Classical Philology has been an internationally respected journal for the study of the life, languages, and thought of the Ancient Greek and Roman world since 1906. The journal covers a broad range of topics from a variety of interpretative points of view." DTL coverage: 1906-2015 (Vol. 1, No. 1 - Vol. 110, No. 4) with a 2 year moving wall. "The Classical Review publishes informative reviews from leading scholars on new work covering the literatures and civilizations of ancient Greece and Rome. Publishing over 150 high quality reviews and 50 brief notes every year, The Classical Review is an indispensable reference tool, essential for keeping abreast with current classical scholarship." DTL coverage: 1887-2012 (Vol. 1, No. 1 - Vol. 62, No. 2) with a 5 year moving wall. For access issues from 2013 - 2016 click HERE. "Classical Antiquity explores interdisciplinary research and discussion of major issues throughout the field of classics, including Greek and Roman literature, history, archaeology, art, philosophy and philology — Bronze Age through Late Antiquity. From extant written materials to newly unearthed art-objects, Classical Antiquity's coverage of the Greco-Roman ancient world is truly expansive." DTL coverage: 1982-2015 (Vol. 1, No. 1 - Vol. 34, No. 1) with a 3 year moving wall. "Since its first appearance in 1852, as a journal of textual criticism, Mnemosyne has been securing its position as one of the world's leading journals in its field. Its position is built on the thorough and famous Dutch academic tradition. Authors around the world contribute to Mnemosyne which results in a unique and special combination of European and American visions. Its presence in libraries around the globe is a sign of its continued success as an invaluable resource material. Featuring primarily English articles, Mnemosyne also contains an extensive Book Review Section and the worldwide famous 'Miscellanea' section (short articles on particular excerpts). The Book Review Section does not focus at one single field, but utilizes a multidisciplinary approach." DTL coverage: 1852-2012 (1ste Deel - Vol. 65, Fasc. 4/5) with a 5 year moving wall. "Publishes original research on a variety of topics related to the Classics, in all areas of Classical Philology and its ancillary disciplines, such as Greek and Latin literature, history, archaeology, epigraphy, papyrology, patristics, the history of Classical scholarship, the reception of Classics in the Middle Ages, the Renaissance and beyond." DTL coverage: 1976-2017 (Vol. 1 - Vol. 42, No. 2) with a 3 year moving wall. "The Editorial Committee of Harvard Studies in Classical Philology welcomes all submissions dealing with any aspects of the civilizations of ancient Greece and Rome. In considering submissions for publication in Harvard Studies, we adhere to an inclusive definition of what constitutes philology, and we welcome variety in approaches to the study of the ancient world. In addition to scholarship on language and written texts from the ancient world, HSCP publishes work, for example, on ancient history, philosophy, art history, and the reception of classical culture in late antiquity, the medieval period, and beyond." "Since its founding in 1880 by Basil Lanneau Gildersleeve, The American Journal of Philology has helped to shape American classical scholarship. 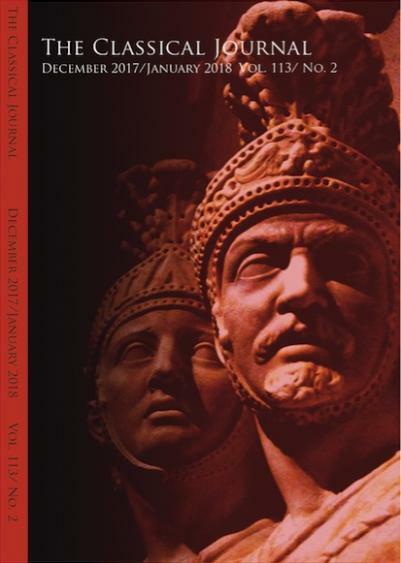 Today The Journal has achieved worldwide recognition as a forum for international exchange among classicists and philologists by publishing original research in Greek and Roman literature; classic linguistics; and Greek and Roman history, society, religion, and philosophy." DTL Coverage: 1880-2012 (Vol. 1, No. 1 - Vol. 133, No. 4) with a 5 year moving wall. For access to years 2013-2016 click HERE. 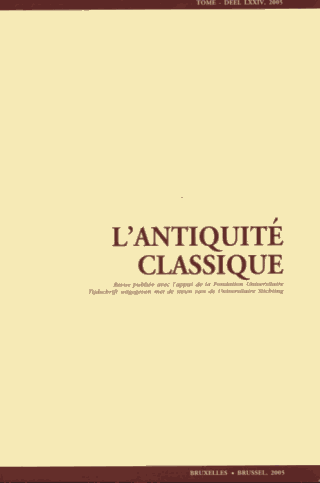 L’Antiquité Classique est une revue annuelle, de renommée internationale, spécialisée dans le domaine de l’Antiquité grecque et romaine (de la période préhellénique jusqu’à l’Antiquité tardive ou aux aspects de la Renaissance liés aux études antiques). Soutenue par la Fondation universitaire de Belgique et le Fonds de la Recherche scientifique (FNRS), la revue publie dans les langues usuelles de la recherche (anglais, français, allemand, italien, espagnol…) des contributions originales, soumises préalablement à l’avis d’un Comité de lecture (avec experts internationaux). "The Journal of Hellenic Studies was first issued in 1880 and is internationally recognized as one of the foremost periodicals in the field of Classical scholarship. It contains articles on a wide variety of Hellenic topics, and reviews of recent books of importance to Greek studies." "The Journal of Roman Studies publishes papers in the full range of the field which the Roman Society was established to promote, i.e. 'the study of the history, archaeology, literature and art of Italy and the Roman Empire, from the earliest times down to about A.D. 700'. The emphasis is on historical themes, but there are also articles on literary, archaeological and art historical topics, including issues of cultural and intellectual history that cut across these categories." "Phoenix, journal of the Classical Association of Canada, publishes scholarly papers embodying original research in all areas of classical studies: the literature, language, history, philosophy, religion, mythology, science, archaeology, art, architecture, and culture of the Greek and Roman worlds from earliest times to about AD 600." "Fondée en 1845 par Léon Rénier, la revue publie actuellement deux fascicules par an formant un tome. Chaque fascicule comprend : des articles (linguistique, histoire, littérature…); un bulletin bibliographique d’une trentaine de pages rendant compte des parutions récentes sur le monde antique; les résumés en anglais et en français des articles du fascicule;dans chaque premier fascicule, une Chronique d’étymologie grecque conçue et réalisée en liaison avec le GDR 1038 (Linguistique du grec ancien) "
"La Revue Latomus, fondée en 1937 par Marc-Antoine Kugener, Léon Herrmann et Marcel Renard, puis continuée par Carl Deroux, est actuellement publiée sous la direction de David Engels, avec l'aide financière du Ministère de la Communauté Française (Direction générale de l'enseignement non-obligatoire et de la recherche scientifique) ainsi que de la Fondation Universitaire de Belgique." "Spanning almost one thousand years, from the first Olympic Games in 776 BC to the death of Marcus Aurelius in AD 180, this accessible and wide-ranging reference work draws on the groundbreaking Oxford Classical Dictionary to present more than 2,500 entries on the civilizations of ancient Greece and Rome. The dictionary covers key aspects of ancient Greek and Roman life and literature, such as science, social structure, philosophy, and religion, and contains comprehensive articles on central figures, both real and mythological, from Achilles to Zeno." "In this philosophy classic, which was first published in 1951, E. R. Dodds takes on the traditional view of Greek culture as a triumph of rationalism. Using the analytical tools of modern anthropology and psychology, Dodds asks, "Why should we attribute to the ancient Greeks an immunity from 'primitive' modes of thought which we do not find in any society open to our direct observation?" Praised by reviewers as "an event in modern Greek scholarship" and "a book which it would be difficult to over-praise,"
"From one of the world's leading authorities on the subject, an innovative and comprehensive account of religion in the ancient Roman and Mediterranean world In this ambitious and authoritative book, Rüpke provides a comprehensive and strikingly original narrative history of ancient Roman and Mediterranean religion over more than a millennium--from the late Bronze Age through the Roman imperial period and up to late antiquity. While focused primarily on the city of Rome, Pantheon fully integrates the many religious traditions found in the Mediterranean world, including Judaism and Christianity. This generously illustrated book is also distinguished by its unique emphasis on lived religion, a perspective that stresses how individuals' experiences and practices transform religion into something different from its official form. The result is a radically new picture of both Roman religion and a crucial period in Western religion--one that influenced Judaism, Christianity, Islam, and even the modern idea of religion itself." Greco-Roman Religions LibGuide by Christopher Crawford is licensed under a Creative Commons Attribution-NonCommercial-NoDerivatives 4.0 International License.